WHAT’S OFFERED: WebMD & Vitals will be offering $50 OFF per month ($600 per year) of our Enhanced Profiles when you sign up at the show! Meet us @Booth 6831. – Enter code: AAOS19 in the form. 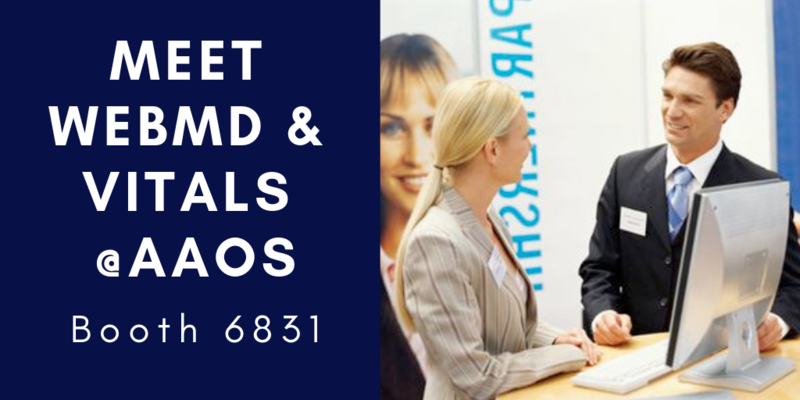 – We will contact you within 24 hrs to schedule a time to meet with you at the show for a quick 15 min demo. If you find we are the right marketing service for you, your $50 OFF per month ($600 per year) will be applied to your contract. Founded in 1933, the Academy is the preeminent provider of musculoskeletal education to orthopaedic surgeons and others in the world. Its continuing medical education activities include a world-renowned Annual Meeting, multiple CME courses held around the country and at the Orthopaedic Learning Center, and various medical and scientific publications and electronic media materials. Learn more HERE. * Discount applies to a 6 Month or Annual contract. Discount is only applicable towards newly purchased services; cannot be applied to services already in use. Discount is applicable to Tier 1 and Tier 2 pricing.